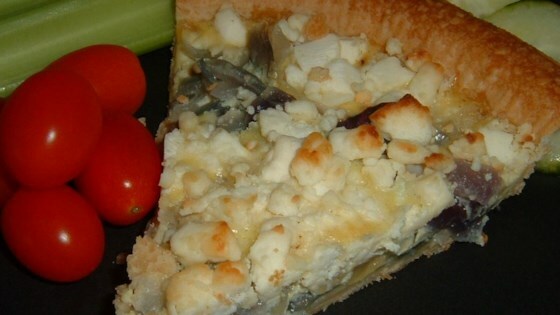 "Try this delicious combination of red onions and goat cheese. Serve warm with a fresh salad." Line a 9 inch fluted, loose-bottom flat tart pan with pastry. Chill for 15 minutes. Cover with foil, and fill with pie weights. Bake for 10 minutes. Remove foil and weights, and bake for a further 5 minutes. Put onions in a roasting tin, and drizzle over the oil. Season with salt and pepper. Roast for 15 minutes. Set aside to cool. Reduce oven temperature to 375 degrees F (190 degrees C). Beat together egg yolks and cream, and season with salt and pepper. Arrange the red onions over the base of the baked pastry. Pour cream mixture over onions. Slice the goat cheese thinly, and dot over the top of the tart. Bake for 30 minutes, or until custard has just set. A delicious, free-form tart with a bit of sweet and savory! Huge hit at my husband's birthday bash. I made tartlets using the pie crust and mini cupcake tins. It was great for individual serving sizes. Whole onions make it really had to cook thoroughly. Now my girlfriend boggles her eyes wherever onions are mentioned. Don't bother with this, unless you really love raw onions. I made this for a BBq and everyone loved it. It was really very good.